Are you looking for a fun DVD to entertain your children? 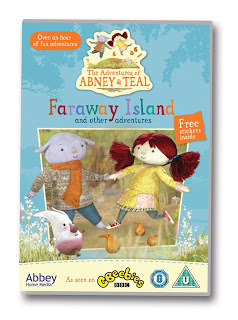 On the 9th September 2013 Abbey Home Media are releasing the new DVD, The Adventures of Abney and Teal - Faraway Island. Yesterday Maxwell and I sat down on a wet weather day and watched the DVD together. I was excited to see Maxwell's thoughts on the DVD as he has watched the programme on Cbeebies many times. Abney and Teal is about two animated rag dolls named Abney and Teal who live in a park, in the middle of the busy,big city. Abney lives in a hut at the base of a tree and Teal sleeps in the branches of the tree. They share their island home with a group of friendly and hilarious characters, and together they are always ready for an adventure. Maxwell enjoyed the DVD, he has turned into a TV addict recently and loves to lie along our sofa, eating a snack and watching programmes. 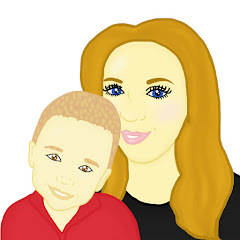 On the DVD there are many funny moments throughout as well as lots of fun and adventure for children to enjoy. I found that the story line was easy enough for the children to follow and it teaches the value of friendship, adventure and fun. The film features 8 episodes. Each episode lasts about 11 minutes which is a good length of time for most children to be able to sit still and enjoy a programme. The show is aimed at 3 to 6 years old, although Maxwell is a little young just yet, he enjoyed following the film and loved the fun characters. If you are buying the DVD your children will be in for a treat as the DVD comes with some fun stickers for your children to enjoy. Maxwell loves stickers and stuck the stickers to his T-shirt with a little help from me. The remaining stickers will go in his craft box for him to enjoy at a later date. Overall I would definitely reccomend this DVD to parents. It is perfect for wet weather days and I loved that all the programmes were only 11 minutes long as this means children do not have to sit down and watch all the episodes at once, they are able to go back and watch the DVD at a later date.